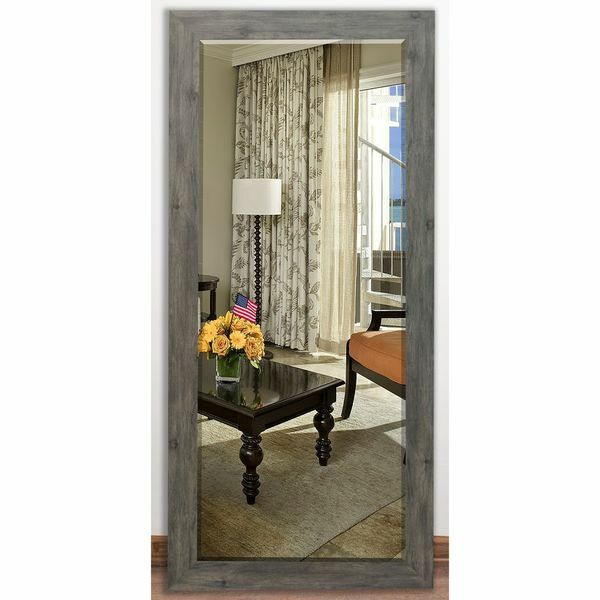 This stunning full-length wall or floor mirror is sure to bring your country style decor to the next level. The delightful frame features a delicate natural wood grain with a perfectly weathered appearance. The gray tone of the frame takes the style a bit further and gives the attractive look of old barn wood. The aged weathered look of this beveled mirror design will enhance your country decor. R064BT: 26.5 x 60 inches (interior), 32 x 65.5 inches (exterior). R064BXT: 25 x 65.5 inches (interior), 30.5 x 71 inches (exterior). Dimensions 32.0 In. X 0.75 In. X 65.5 In. We looked all over many online sites for awhile to find the perfect mirror for above our double sink vanity in our master bathroom. Everything was more expensive, not the right size and/or style. Then I came across this one on sale at Overstock. It was the perfect size width for the vanity and installed well directly on the wall. The weathered gray frame looks so nice, especially in our theme of whites and grays. Very pleased with both quality and price! Beautiful mirror. The frame is thinner than I expected but it will look nice if hung. I think the frame is too thin to lean. The wood finish is the perfect shade of grey. This mirror is so well-made and easy to hang. It is hard to find a nice mirror without a really thick frame. What is nice is that it hangs flush on the wall, so you don't have any space sticking out on the sides, unlike really cheap mirrors from the retail chain stores. I am going to buy another one to match in a different size if i could find it. Great buy! Tall and wide fits perfectly! I bought two of them; one for my living room and one for bedroom. Color of the wood frame is awesome! Full length rustic farm look mirror can be mounted on the wall. I prefer leaning it up against the wall because it can be easily moved to a different location. This is a very good quality item. I was really impressed with the packing/shipping as it was well packed to ship and to protect the mirror. Miro is extremely sturdy. Has high end finishes and will give your house a new look. I wish they would have had an even bigger version than this. It comes with its own hooking system and it is very easy to install. Highly recommend if looking for a medium size nice looking mirror. I wanted/needed a full length mirror in my guest room that was beautiful and matched the decor. This one fit the bill. It's a statement piece as well and being very useful. I found the same mirror on another website for more money so I knew Overstock's price was the best. Lightweight and easy to hang on the wall. The price is great, quality is good - perfect for hanging on a bedroom door as well. Color is a nice washed grey. Great quality mirror. Would definitely recommend. Love my new mirror! It is beautiful and looks even better than I thought it would! The color is true to the description and matches perfectly with my furniture. Love this item would definitely get it again and would recommit to anyone that wanted to get one in the future it is definitely worth the cost of item. This is awesome piece of furniture. It’s nice and heavy and seems well made. We haven’t hung it yet but we will place it just above the baseboard so it’s not on the ground. Earthquakes make me not wanting to rely on it staying put in the event that happens. First mirror arrived damaged. Item was replaced. The replacement is beautiful. Really love this mirror. People are always complimenting this mirror! It's extremely chic and really warms up a space. I love this mirror. I have it in the corner of my living room and it is very tall. It makes my room look so much bigger. It is a great size and I got a great price for it. The weight of this mirror is approximately 42 pounds.